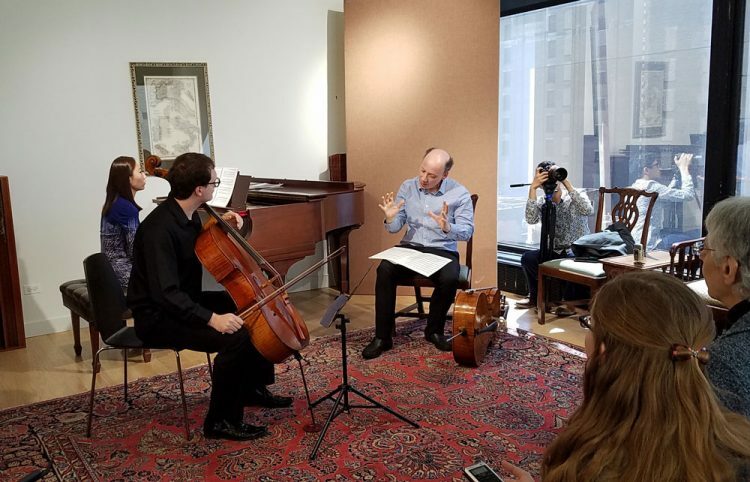 Guarneri Hall NFP is a not-for-profit classical music incubator in Chicago whose home is a new, acoustically engineered and technologically advanced 60-seat performance space on the third floor at 11 East Adams Street in the Chicago loop. Guarneri Hall NFP presents live classical music performances in Guarneri Hall and elsewhere in the city of Chicago and sponsors music education programs in the Chicago community, with a special focus on reaching young people with limited access to classical music. Live streaming of Guarneri Hall events will be available on our website, https://guarnerihall.org. Guarneri Hall NFP aims to be a leader in the field of music education, providing advanced training for professional ensembles, soloists, music educators, and students, as well as curriculum support for classroom teachers through teacher training initiatives that promote best practices. Guarneri Hall NFP also makes educational resources such as print material and tutorial videos available online to the Chicago community and beyond. Guarneri Hall NFP serves as a facilitator and catalyst for emerging musical artists, musical groups and music education initiatives. Today, violins by Bartolomeo Giuseppe Guarneri (1698-1744) are considered to have equaled and even surpassed those of his famous competitor, Antonio Stradivari, in desirability. Guarneri Hall is named in honor of this great craftsman, who produced some of the most miraculous musical instruments of all time. Acceptance of any contribution, gift or grant is at the discretion of Guarneri Hall Not for Profit. Guarneri Hall NFP will not accept any gift unless it can be used or expended consistently with its purpose and mission. Guarneri Hall NFP will accept donations of cash; gifts of in-kind services will be accepted at the discretion of Guarneri Hall NFP. Certain other gifts such as in-kind gifts and contributions whose sources are not transparent or whose use is restricted in some manner must be reviewed prior to acceptance due to the special obligations raised or liabilities they may pose for Guarneri Hall NFP. Any donations received will be used to help defray the expenses of concerts, other public events, and programs we sponsor. Guarneri Hall is a 501(c)(3) nonprofit; thus, your gift may qualify as a charitable deduction for federal income tax purposes.